How Iron Man 3 draws from Charles Dickens’ A Christmas Carol. Set during Christmas, Iron Man 3 is inspired in part by Charles Dickens’ A Christmas Carol. Of all the odd things about this year’s first big summer blockbuster, Iron Man 3, perhaps the oddest is that it takes place during Christmas. Though it’s being released in May, it’s filled with Christmas lights, Christmas gifts, snow storms (including one in Tennessee), and grenades improvised from Christmas ornaments. I think if you’re doing something on an interesting scale that involves an entire universe of characters, one way to unite them is to have them undergo a common experience, and there’s something about Christmas that unites everybody. It already sets a stage within the stage. Wherever you are, you’re experiencing this world together. There’s also something just pleasing about it to me. I did Lethal Weapon back in 1987 and we set it at Christmas and [producer] Joel [Silver] liked it so much he put Die Hard at Christmas. We don’t have to do every film that way! Black added that Christmas is “a time of reckoning for a lot of people, when you take stock of how you got to where you are now,” and when lonely people feel a little lonelier. But which characters, and which ghosts? With a little help from interviews with Black, we’ve broken it down as best we can below. 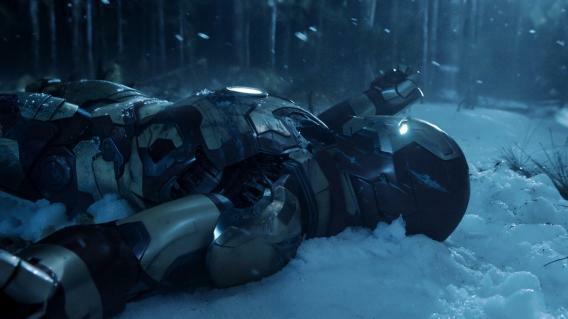 Iron Man 3 is full of specters from Tony’s past coming back to haunt him—many of them from the 1999 holiday season. The movie starts by flashing back to that New Year’s Eve, and Tony, in the midst of his most braggadocious and self-centered pre-crime-fighting phase, jilts two different admirers: the scientists Maya Hansen (Rebecca Hall) and Aldrich Killian (Guy Pearce). We later learn that Stark’s actions at this holiday party turned both of these mad scientists against him. It’s Maya who returns to Tony first, sending him on a journey that will take him to Tennessee and back to his own childhood, which makes her the character most similar to the Ghost of Christmas Past. As Black has put it, “He meets this woman who attacks him as the ghost of all the women he’s left in the morning without calling.” After Maya visits and Tony scrambles off, he meets Harley, a boy whose absent father and penchant for building gadgets reminds Tony of his younger self. “It’s him as a young boy, virtually,” Black has said, “He’s the ghost of Christmas past.” So Harley and Maya are each ghosts from Tony’s past, really. Black and Pearce did not adapt A Christmas Carol so faithfully as to choose only one. Left: The Mandarin (Ben Kingsley) in Iron Man 3. Right: The Ghost of Christmas Present, in an 1843 illustration from the first edition of Charles Dickens’ A Christmas Carol. Left: Detail of official poster for Iron Man 3. Right: Image in the public domain via Wikimedia Commons. 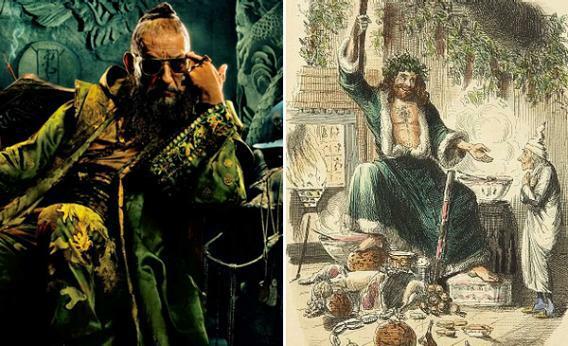 The Ghost of Christmas Present—the Father Christmas-like “jolly giant” of Dickens’ tale, with the long beard and green robe—is the last person you’d expect: The Mandarin. In addition to their similar taste in clothing and facial hair, the Mandarin turns out to be a jolly old fellow. Really, we find out, he’s just a British actor named Trevor Slattery, who cracks open Budweiser after Budweiser and generally serves as the life of the party. In Dickens’ story, it’s also the Ghost of Christmas Present who takes our protagonist to the holiday feast of Bob Cratchit, and the son he hopes to heal, Tiny Tim. In Iron Man 3, it’s Slattery who tells our protagonist to check on the Vice President, who is having a Christmas feast with the crippled daughter who he hopes to heal. Of course, the Vice President turns out not to be so benevolent at Cratchit. In A Christmas Carol, the Ghost of Christmas Future, the most menacing figure of all, confronts Scrooge with the specter of dying alone. This finally prompts Scrooge to grow a heart and give more consideration to others. In Iron Man 3, the Big Bad is Aldrich Killian (Guy Pearce), who transforms into a skeletal figure (using Extremis, a technology of his own invention) and steals the only person Stark has in his life, Pepper Potts (Gwyneth Paltrow). This crisis prompts Tony to reconsider his priorities—namely, the way he puts his work before his loved ones—and he chooses Pepper over his suits. In the end, this change of heart is made literal: Iron Man tosses out the old arc reactor that sat in his chest, and he perfects the Extremis technology in order to mend his heart. It’s a Christmas miracle.